My hometown has a population of approximately 55,000 people and seven school districts. These districts have always acted as rivals rather than schools that form a united community of students. Three years ago my superintendent and I decided to attempt to change that. Our goal was to unite our community for the sake of literacy. I would be acting as our local Reading Council President to rally support from teachers, and he would do the same with superintendents. I discussed the idea with teachers/librarians during our Tri-Lakes Reading Council meetings, and he discussed it with superintendents during their administrator meetings. We were pleased that others liked the idea of bringing our community together and were willing to serve on a committee to create a plan. The Garland County READS Committee has representatives from each district and several community stakeholders. The committee decides and plans activities to promote reading in our city. The committee developed a plan to create a county-wide reading event. Each member recruited donations from businesses and volunteers from civic organizations, teachers, businesses, community leaders, etc. 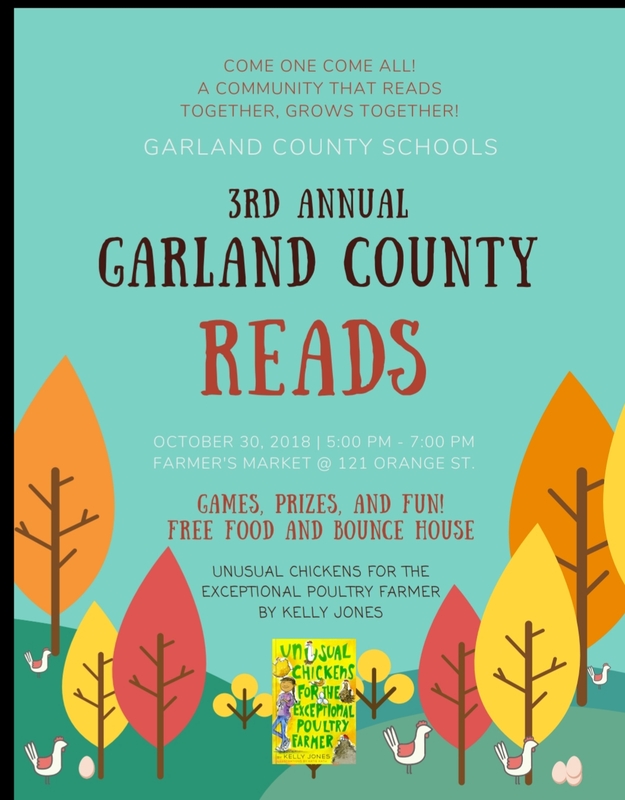 On October 30, 2018, we hosted our 3rd Annual Garland County READS Festival in the center of town, at the Farmer’s Market. 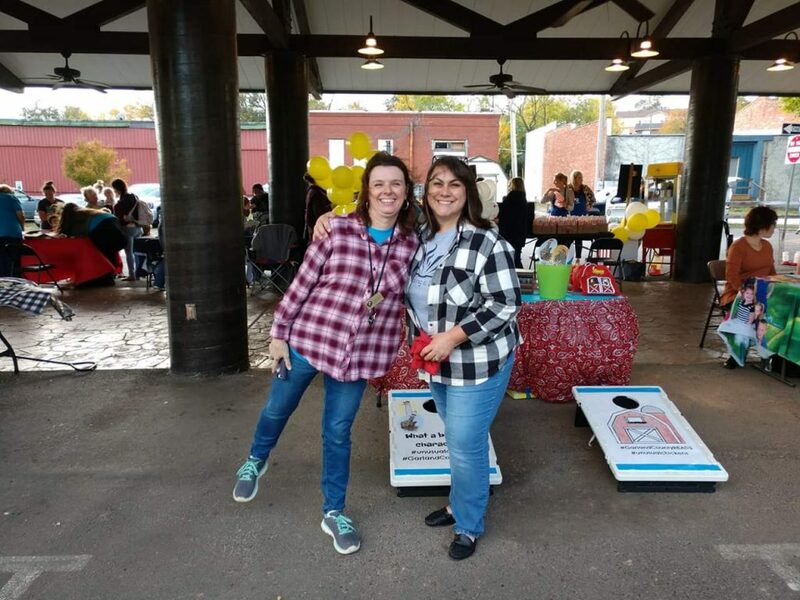 We had games hosted by school librarians in each district, as well as representatives from the public library, Dolly Parton’s Imagination Library, a local teacher’s college, and civic organizations. Churches, parent groups, and local businesses hosted fun activities for attending families. Games and activities all connected with a theme from the book selected. The disc jockey welcomed attendees to the festival at 5:00 p.m. Families walked around participating in activities and booths, as well as grabbing a bite to eat from the bank-sponsored food trailers. At 5:30 p.m. the disc jockey announced that all children needed to find a reading circle to listen to the first chapter of our shared book. We had superintendents, firefighters, political figures, and other community leaders reading to children in these circles. After families listened to the first chapter, activities continued until 7:00 p.m. All food, prizes, games, and activities were FREE to attendees. It was a difficult task to choose the book that our community would read. The committee reviewed several selections, seeking quality literature that would be on the interest level for kindergarten-6th-grade students, as well as cost effective. Each school district is responsible for purchasing the chosen book for each student in their district, K-6. The committee created a reading calendar that noted the pages to be read and any activities for the day; the calendar was sent home with an informational parent letter explaining the importance of reading with their children. Resources were shared with educators to encourage book discussions at school. Flyers were posted in the community, on social media, and in the local newspaper to invite families to the reading event. 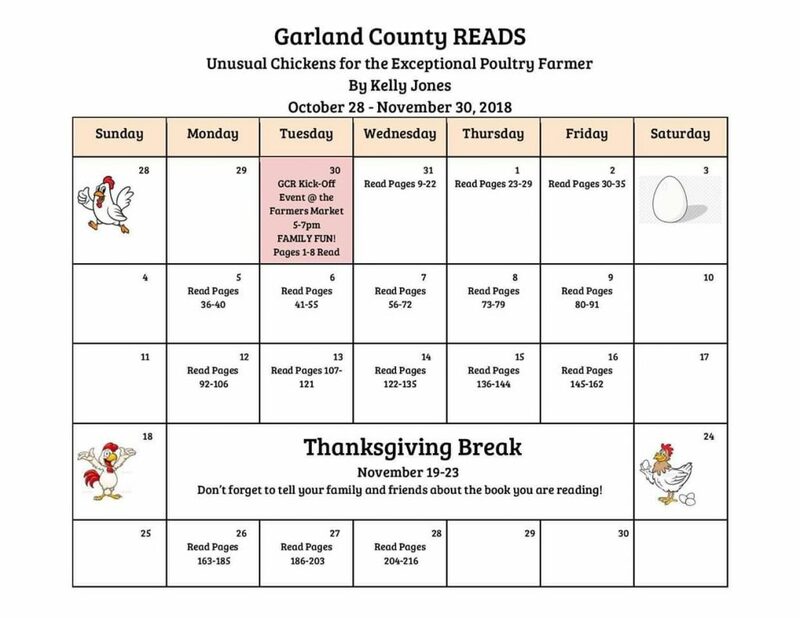 This year our book selection was The Unusual Chickens for the Exceptional Poultry Farmer by Kelly Jones. This book was chosen for several reasons. It had been selected for Arkansas’s nominated award booklist; it was fairly new and would appeal to all elementary age students; it is an epistolary novel as it is written as a series of letters; and it could be bought for under $5 per paperback. 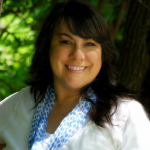 I reached out to author Kelly Jones via Twitter to request a personalized video for our schools to show their elementary students, which she graciously did. Her publisher, Penguin Random House, created graphics to print and place on craft sticks as photo props and/or puppets. I post a daily trivia question to 5th- and 6th-grade students via the school library’s Google Classroom and announce winners each Friday afternoon. Students stop by the school library to pick up their prizes. 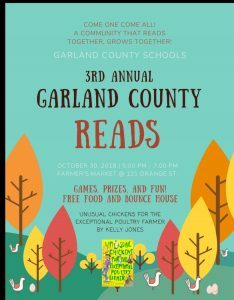 I snap a photo for my school’s Facebook page and include the Garland County READS hashtag. I also, have a quick discussion about the book with my 5th- and 6th-graders when they come to the school library for class.